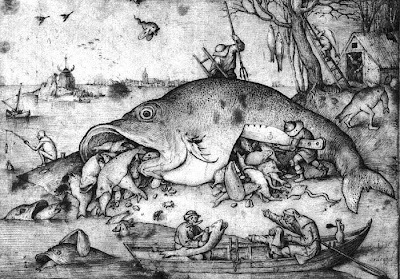 Well, if we’re being technical about it, it all began with Pieter Bruegel the Elder. Spencer pointed out that the ink-on-paper work Big Fish Eat Little Fish reminded him of Ponyo, which I made him watch and which was actually pretty good. Didn’t see it? A one-sentence summary: fish and other oceanic things being bigger than you’re used to seeing, all through the lens of childlike fantasy. Plus Tina Fey, Betty White and Cloris Leachman are there. I don’t know why I doubt Miyazaki. Yes, it’s Japanese animation, but it’s not the robots-fighting-tentacle-monsters variety, and anyone I spend time with is smart enough to appreciate his movies for what they are and not what the uninitiated think they might be. Spencer’s right. Something about the literally visceral aspect of anything spilling from a slit in some dead thing’s belly — even if it’s whole, apparently undigested fish instead of entrails — coupled with the general cartoonishness and fantastic elements, like the strange airborne creatures and the bipedal fishman, add up to Miyazaki-esque. It’s totally a Ponyo. This strange little scene ultimately led to another work by P.B. 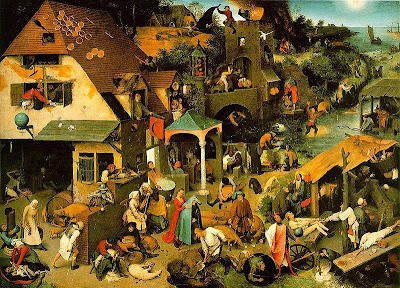 the E.: an oil-on-oak panel painting known variously as Netherlandish Proverbs, The Topsy Turvy World and The Blue Cloak. The work should be familiar to anyone who even remotely follows indie music, as a section of it served as the album art to the Fleet Foxes’ debut studio album. More than just a busy, well-populated Where’s Waldo? predecessor, Netherlandish Proverbs literalizes a whole host of old-timey sayings from viking country. (Really, it is more of a forerunner to that digital collage that literalized band names and challenged us all to see how many we can find.) Wikipedia lists all the proverbs and even offers a detail of the portion of the painting that refers to whichever proverb. And it’s in these bits of iterated and reiterated wisdom that I found most amusing along this Wikipedia garden path. The proverbs don’t make any less sense than the ones I grew up with — “To each his own, said the farmer’s wife upon kissing the cow” — but they make me laugh nonetheless by virtue of how inscrutable they are. “The die is cast,” meaning, of course, “The decision is made” — apparently indicating that this one proverb either made the jump into English or that it’s common enough to exist in multiple languages. “To be as patient as a lamb,” meaning “to be very patient” — for no apparent reason, I might add, as I’ve spent considerable time around lambs and know that there’s very little about them that would suggest they have more patients than any other dumb, four-legged animal. One of the work’s alternate titles, by the way, is inspired by yet another proverb, “She puts the blue cloak on her husband,” which means “She deceives him.” Curiously, “Big fish eat little fish” is listed, but without any explanation. Perhaps because it’s self-explanatory? I am familiar with Big Fish Eat Little Fish. I like that the title states a simple scientific fact, but the illustration is more magical than scientific. It's an odd work but a very engaging one. Wasn't "the die is cast" originally a Latin expression? Hmm.. well, I don't know any artistic stuff, but am I the only one who feels that Ponyo is an evil piece that discuss the most depressing theme with the most disturbing imagery?